Despite being on a team that was classified as Division II, Kailua's Naia Graham stood head and shoulders above the rest in terms of goal scoring. Graham, a senior forward, led the state with 28 goals scored and was selected as the ScoringLive/All-Hawaii Boys Soccer Offensive Player of the Year. "Naia was probably the most controlled player with a combination of speed and power," Waipahu coach Steve Santiago said, whose team Graham torched for four goals in the title game of the Oahu Interscholastic Association Division II Tournament. "He could take a ball and move it wherever he wanted." Graham helped the Surfriders to a 9-6 overall record and 6-4 mark in the OIA Eastern Division this year. Along the way, they hung tough with most of the D1 teams and even beat a few of them. "I think it's just that he's able to compete against anybody and he's a load to handle on the defensive end," Kapolei co-head coach Ryan Lau said. "I think anytime you can have a threat like that it's hard on the defense. At anytime he can make a critical game-changing play and he can be a finisher from 75 yards-and-in, so you've got to account for a guy like that." Graham scored a goal in all but four of Kailua's games this season. He scored 15 goals during a three-game stretch against Farrington, McKinley and Kaimuki early in the second. He was instrumental in helping Kailua to its first league championship since 2010 and was named to the All-OIA East First Team as an attacker. "He forces you to redirect your defensive play," Santiago said. "He requires you to put extra players to maintain that he does not get the ball. When he gets the ball, it's a gimme that something will happen, so your job is to prevent him from getting the ball by doubling him up, but what that does is it frees other players on the field and a team which has other players that can play, will tear you apart." Graham accounted for more than half of the Surfriders' total goals scored this season. "I think he has a good nose for the ball and he's very assertive up front," Lau said. "I think he strikes the ball really well, so with that he's able to be a finisher. I think he has the size to play size — when you're upfront it's just about creating that one yard of separation and being able to beat the guy — and I think he's a very good threat in that sense." Graham closed out his decorated prep career by being named to the Division II Outrigger Resorts/Hawaii High School Athletic Association All-Tournament Team. Mililani's Jeron Cunningham was selected as the Defensive Player of the Year after anchoring the defense for the Division I state champions. Cunningham, a senior center fullback, was the field general for the Trojans' defense that allowed just five goals all season. 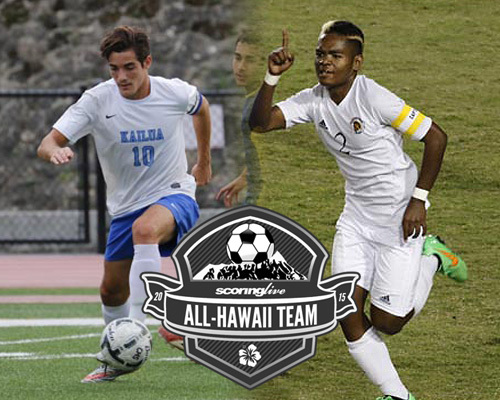 He also scored five goals on the year, including the lone goal in a state semifinal win over Punahou. "He easily could have been the player of the year, not even just defensive," Kalani coach Michael Ching said of Cunningham. "He's very deserving. He's the best defender on probably the best defense in the state and this was a year with a lot of really good defenders, but I think he kind of stood out as one of the leaders out there on that defense." The Trojans won their final 10 matches of the season to finish 9-1 in the OIA West and 15-1 overall. They claimed their 16th league title and sixth state championship in school history. Cunningham was named Most Outstanding Player of the state tournament. "I think Mililani clearly was one of the best defenses in the state and he was there as a captain and a guy that's always there if they did make a mistake — which was very few — but it's nice to have someone who's just powerful, speedy, reads the game real well to clean up after you," Ching said. "It wasn't against us, but I saw that goal that he scored against Punahou in the semifinals on the free kick and from a defender that's fantastic. He would go up on set pieces — and set pieces were a big deal for Mililani — so he would be a big threat in the air, so he was kind of a dual-threat for them. I'm sure he probably could have played played forward, or center mid, but I think they stress defense over there, so with him back there, they were just really hard to beat. We played against them two games and we didn't score any goals and it was in large part due to him." Mililani's Steve McGehee was selected as Coach of the Year after guidling his team to a 15-1 mark and D1 state championship in just his first season. The longtime assistant to former Trojans' head man, Jeff Yamamoto, made his own mark by bringing home the school's first OIA crown since 2013 and first state title since 2012. McGehee narrowly edged out Mid-Pacific's Jayson Abe for the honor.